It's easy to be cynical about a new partnership between a technology company and a supercar manufacturer. Links between the two are somewhat tenuous, and the scripted, slightly awkward launch event at McLaren's UK headquarters saw the team's Formula One drivers stumble their way through reasons why they liked the new phone. But you shouldn't judge a book by its cover — indeed, the 6T McLaren Edition is actually housed within the final page of a book included in the phone's special retail box. The book offers a potted history of the McLaren car company and race team. It is joined in the box by a phone case with a carbon fiber weave pattern on its back, and a perspex plaque containing a real piece of F1-grade carbon fiber. There's also a headphone adapter, wall plug, and a heavy-duty braided USB-C cable finished in Papaya Orange, the official color of McLaren's F1 team. These extra trinkets may be disregarded by some buyers, but the special box, cover, plaque and branding throughout makes the phone feel like more than a cynical tie-in between two unrelated brands. OnePlus and McLaren have thought about this, and the overall result is well-judged rather than tacky. 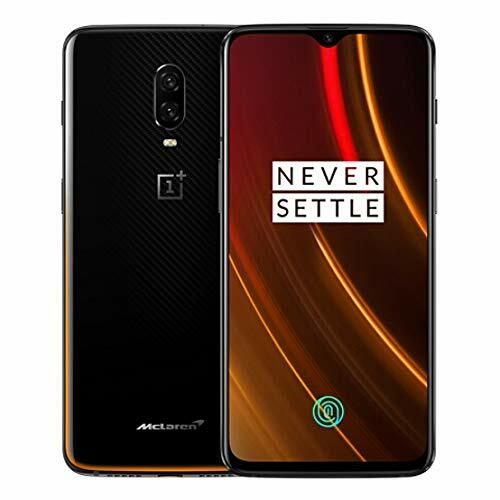 As for the phone itself, it is differentiated from the regular 6T by having a carbon fiber weave, McLaren logo and orange detailing on its back, along with a huge 10GB of RAM (up from eight) and the ability to charge faster than any previous OnePlus phone. With power delivery upped to 30W, the battery can be refueled from zero to 50 percent in just 20 minutes. As I alluded to above, the McLaren Edition stands out thanks mostly to the design of its rear side. A smart orange highlight runs around the lower edge and up the sides of the handset, while a subtle carbon fiber weave can be seen shimmering in the light. It's a subtle effect which I personally think looks excellent. 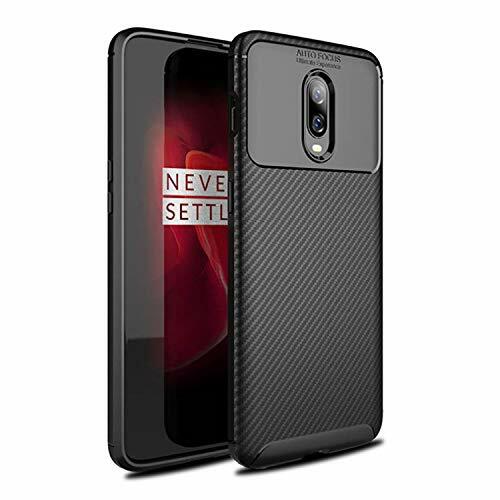 I'd even argue that OnePlus has done a better job of making decorative carbon look attractive and disable here, than some supercar makers do when applying it liberally to their dashboards and steering wheels. 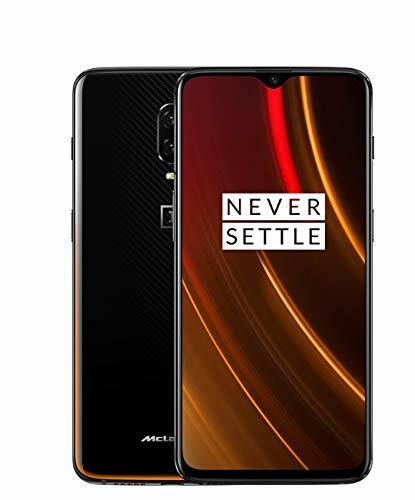 A stylish chrome McLaren logo finishes the phone off nicely, while the OnePlus logo remains in its usual position. Everything else is the same as the regular 6T, which means a dual-lens, 16-megapixel rear camera mounted centrally, a very small display notch housing a 16-megapixel camera on the front, and a fingerprint reader embedded into the display. There are volume buttons on the left and a power/screen lock button on the right, joined by a slider used to quickly switch notifications from loud to vibrate-only or completely silent. I wish more smartphones had this feature, as it's a useful and reliable way to quickly mute your phone. A USB-C port sits at the base of the phone, and although there's no headphone jack, OnePlus includes an adapter in the box. The OnePlus 6T's display measures 6.4 inches and has a resolution of 1080 x 2340. This means a pixel density of 402 per inch and an aspect ratio of 19.5:9 - the latter stat making for a screen which is tall and narrow, but not as aggressively so as those on recent Samsungs. The display is fractionally cooler than that of the iPhone X I use everyday, and is affected a little more by colors shifting when viewed from an angle. But these are very small differences, and in regular day-to-day use the 6T is one of the best smartphones to come from 2018. Unlike most other recent handsets, the 6T has a very small display notch, which houses only the front-facing cameras and no other components, like a FaceID-style biometrics system. The OnePlus 6T McLaren Edition runs Google's Android 9.0 Pie operating system - one of the first handsets to do so - and the user interface is the latest iteration of OnePlus' own ColorOS. Plus, as you might expect, the default wallpaper includes some McLaren orange details. As well as the wallpaper, the phone is pre-loaded with a McLaren UI theme, which turns some elements of the interface - like the scroll bars and app search bar - orange. OnePlus' regular themes can still be activated from the settings menu if you find yourself suffering from orange-overload. The interface is generally a clean one which is inoffensive and easy to navigate. There are a couple of unnecessary apps baked in, like the Gallery app which doubles what Google Photos already does, but this is a common Android problem and far from unique to OnePlus. Performance from the Snapdragon 845 processor and 10GB of RAM is stunning. This is a huge amount of RAM for a mobile device - it's even 20 percent more than the MacBook Pro I'm using to write this, a machine which never feels slow. It's tricky to really see the extra RAM pulling its weight, but it is reassuring to know the power is there when you need it - likely when more graphically-intensive games arrive over the next 12 months. As for the here-and-now, high-end games like PUBG and Real Racing 3 run flawlessly with their graphics settings turned up to maximum. Storage is 256GB, matching the maximum offered by the regular 6T. The 6T's 3,700 mAh battery is large and lasts a full day, perhaps even two days for less intensive users. But what's important here - and unique to the McLaren Edition - is the ability to charge at 30 watts. Using the included wall plug and orange USB-C cable, this means the phone can restore 50 percent of its battery charge in as little as 20 minutes, using a system called Warp Charge 30. I've tested this and found OnePlus' claim to be accurate. This is the fastest charging rate of any smartphone currently on sale, and the McLaren Edition manages this without heating up excessively, even if you use the phone while it's fast-charging. We suspect Warp Charge 30 will become a standard feature of the next OnePlus, likely called the 7 and due to launch in the summer. Another feature carried over from the regular 6T is the in-display fingerprint reader. This may not seem like new technology to some GearBrain readers, but it's the first time I've used such a system and I'm impressed. It feels perhaps half a second slower than Apple's Touch ID and other traditional print-reading systems, but is about the same speed as FaceID. When locked, the phone displays a fingerprint icon in the lower-third of its display. Rest your finger on this for a moment, and the phone unlocks. It's a fast and seamless experience which feels genuinely impressive the first time you try it. My only criticism is how, to read your print, the screens needs to momentarily crank itself up to 100 percent brightness. This is fine in most situations, but when unlocking the phone in a dark room - after waking up, for example - it can be pretty blinding. I'd like to see OnePlus find a way to illuminate only the portion of the screen needed to read my finger, but it's a small complaint. The McLaren Edition gets the same camera system as the regular 6T, which means a dual-lens system on the back with a 16-megapixel main sensor and a 20-megapixel secondary one used for wide-angle shots. The main sensors has optical image stabilization, while software features include Portrait Mode for adding SLR-style blurred backgrounds, a night mode, AI for recognizing the scene and adjusting settings accordingly, HDR, and Studio Lighting, like that offered by the iPhone XS. These features work reasonably well, but can't match the AI superiority of the Pixel 3 and its industry-leading camera tech. The OnePlus still takes good photos when left in normal mode, but they lack the wow-factor of those taken by rivals from Apple, Samsung and of course Google, maker of the Pixel. The front-facing selfie camera has a 16-megapixel sensor and takes acceptable photos, although the results can sometimes look pale and a little washed out. Portrait Model is available here too and it works, but doesn't map the blur around subjects as accurately as the Pixel 3, instead leaving fuzzy edges, particularly around your hair. For fans of cars and technology - as I am - the 6T McLaren Edition is hard to ignore. It takes a smartphone which is already one of the best on sale, then adds a surprisingly tasteful amount of McLaren detail, while boosting the RAM and upping the charging speed. The commemorative book and plaque housing a piece of McLaren carbon may be passed off as pointless trinkets by some, but there's no denying that the phone itself is a thoroughly handsome device. I love the subtlety of the carbon weave and orange highlighting on its back, and the embedded fingerprint reader works really well. The phone's performance is top-drawer, the faster charging is genuinely useful, and OnePlus' approach to Android is nicely restrained compared to the efforts of other handset makers. The only question is, at $699 is the McLaren Edition worth $70 more than the regular 6T? It really depends if you are a car fan who wants a phone which is a little bit different to everyone else's. For this car fan - and a fan of McLaren in particular - that's likely going to be a yes, but for everyone else the regular 6T represents better value for money.